Bali, 9th October 2018: As the signatory of Grand Bargain Principles (an UN led discourse of WHS) World Bank is urged to promote localization i.e. partnering with the local organizations in Cox’s Bazar, in the Rohingya refugee responses in Bangladesh. 1. To prepare a Rohingya pooled fund in view of GB commitment to promote local NGOs and Community who are leading the response. 3. To consider support GOB for area development approach in Cox’s Bazar to promote economic, social and human development potentialities in the long run. 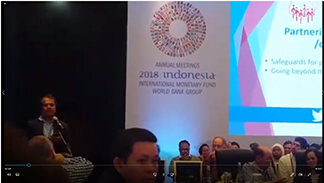 Mr. Hasan, Dean of EDs of World Bank, Ms. Aparna, ED responsible for Bangladesh were also present in the meeting that took place on 9th October 2018 in Bali, Indonesia. In his speech, Mr. Rezaul Karim Chowdhury thanked the WB president Dr. Jim for announcing half a billion USD for Rohingya response. He also mentioned that we had an opportunity to meet Dr. Jim along with UNSG and hand over a memorandum in this relation. Mr. Reza raised question in his speech that why WB should not prepare a plan for localization so that local NGOs / CSOs and local communities would lead a humanitarian and development efforts through a ‘Whole of Society Approach’ (WOSA) as WB is one of the signatories of GB (Grand Bargain). He stressed on reducing the fund management cost through a pragmatic reduction of the internationalized response approach. Mr. Reza also said, the Government of Bangladesh deserves more macro-economic level solidarity support and Cox’s Bazar requires more area development support during the refugee response. Otherwise, this will create vulnerability in the long run for the local people as well as the national economy. Dean of EDs Mr. Hasan said in response that partnering with local NGOs is a reality of political economy. Ms Aparna the ED responsible for Bangladesh accepted the notion of Mr. Reza and said that partnering with local NGOs is a smart partnership.